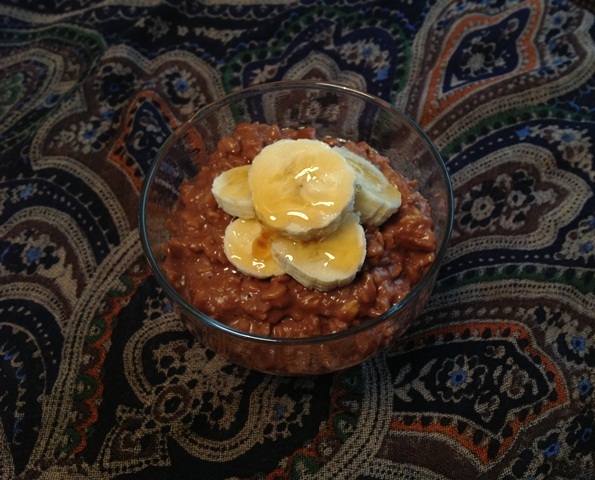 Choco Porridge with Honey and Banana – Is it Breakfast? Or is it Dessert? This is a mini post. The reason is that I had a last minute work thing which ruined my plans for a nice quiet blogging evening. I got home just before 10pm, cold and starving hungry. I then spent half an hour picking meat off the chicken legs I’d made in the slow cooker, and prepping the bones for overnight stock. Dinner was a boring plate of plain chicken and curried yogurt sauce, which sounds exotic but is basically yogurt with curry powder and dried coriander leaves! As you by now know, Mondays are protein only days (Dukan Diet rules) so today has left a lot to be desired in the culinary department. You should have seen me dodging the canape trays swirling round earlier! 1. In a small saucepan mix the milk and oats. Warm mixture over medium heat and when it starts heating up add the chocolate. 2. When the chocolate is nearly all melted, add the cinammon and continue cooking over low heat, stirring continuously. 3. When the porridge has absorbed the milk and thickened to your liking, and the oats are soft, transfer to a bowl. 4. Top with the sliced banana and honey, and add another splash of milk if the porridge has thickened a lot. Note: After trying a chocolate and cinammon ice cream this summer, I have decided these two ingredients were meant for each other. Give them a go! 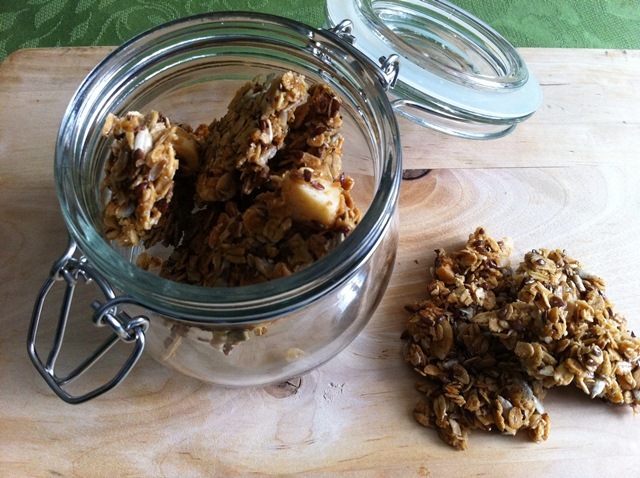 Macadamia, Olive Oil & Honey Granola – Clumpy, Crunchy, Crave-Worthy! I am a breakfast person. It’s my favourite meal of the day. Maybe it’s because breakfast is the fuel that gets us through the next 15 hours or so. Maybe it’s because breakfast calories “don’t really count” towards our daily intake as we can burn them all off (yes, I will continue to tell myself that, thank you). Or maybe it’s because we can get away with eating anything in the morning! Sweet, savoury, fresh, fried, baked, slow cooked; fruit, veg, sausages, bacon, cookies, porridge, spinach pie, apple pie, cake… literally anything! I draw the line at drinking Coke in the morning, but I know many people do. Oats are considered one of the best options for breakfast, due to the slow releasing energy they provide, which keeps us going for much longer and helps us avoid snacking. That sounds really cool, slow releasing energy… Makes me feel a bit super-womany! Recently I’ve realized that it’s actually true. Oats and protein rich foods are best in the morning. Carbs are worst. This is my personal opinion and I have no idea if it is backed up by science! My philosophy is that our bodies speak to us and tell us what they need, what they want, what’s wrong. Ok, not always, or we’re not always in a position to understand the language it uses, but if we try I think usually we can get a good idea of what’s best. After being on the Dukan Diet for a couple of months, I came to realize that protein rich breakfasts are what’s best for me. If I have bread, or a pasty (popular in Greece), or fruit or cereal, I’ll be hungry by 10 and will probably get the shakes and a drop in blood pressure (especially if I have coffee as well). Eggs, ham, yogurt, cheese, all keep my energy going for longer, and my mind free of food related thoughts – at least until lunchtime! Oats also do that. I think they are high in carbohydrates so I’m a bit confused as to why, but they are definitely different to any boxed cereals I’ve ever tried. During winter I love me my porridge. My Grandma used to say if you eat porridge when it’s hot you get itchy (again, no idea what science has to say about that!) so I don’t usually eat it in the summer. Itchiness aside, a hot breakfast in 40 degrees Celsius is not very appealing. A few years ago, I discovered another fabulous way to enjoy oats. Granola! 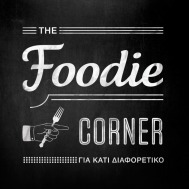 The reason granola came into my life so late is that you can’t get it here in Greece, at least not easily. You definitely couldn’t get it until very recently. So I made my own! 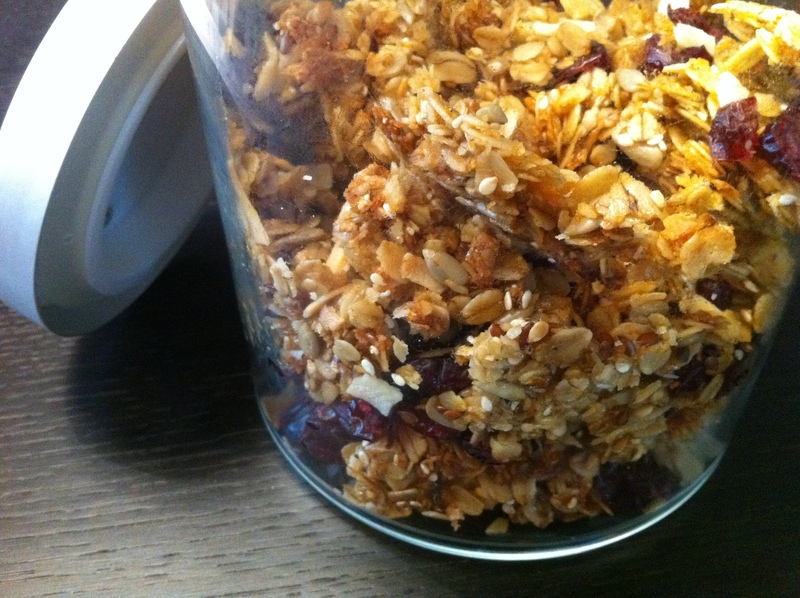 And since then I think the only recipe I’ve made twice is this Coconut Cranberry Granola. There are so many variations, so many ways to experiment, so many tasty ingredients to use, I always want to try something different. Today’s recipe is based on the Coconut Granola by Two Peas & Their Pod. I’ve changed quite a few ingredients but the base is the same, with the same dry to wet ingredient ratio. And it works perfectly. I’ve read many granola recipes and a lot of them mention clumpiness as being a desired but hard to accomplish result. Well, I think the combination of honey with olive oil is great for this. My granola was super clumpy, which is exactly how I love it. It tastes brilliant and it keeps fantastically well in an air tight container or jar. Try it! Preheat your oven to 150C and line a baking sheet with grease proof paper. Mix all the dry ingredients (oats through to salt on ingredient list) in a large bowl and set aside. Combine the honey and olive oil in a small saucepan and heat gently till the honey has completely melted. Whisk till incorporated. Add the vanilla extract to the wet ingredients and stir. Add the wet ingredients to the bowl with the oats and stir well with a wooden spoon till the dry ingredients are well coated with the honey mixture. Turn mixture out on to the baking sheet and spread it out so it’s in a single layer. Try to press it down firmly (a rubber spatula is good for that) as this helps make it clumpy. 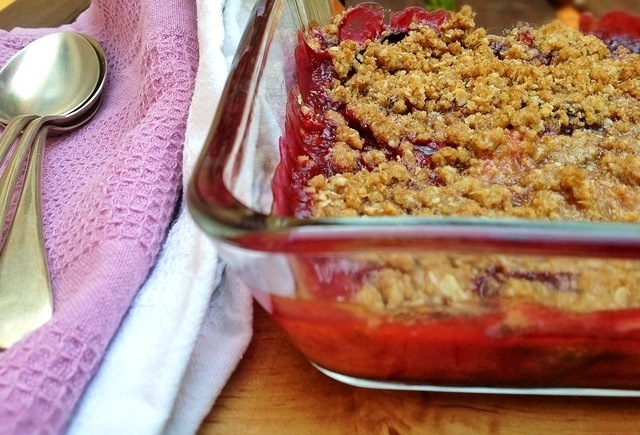 Bake for about 30 minutes or until granola is golden. Don’t let it brown as it will turn bitter. Enjoy with Greek yogurt, milk or –my favourite- buttermilk. 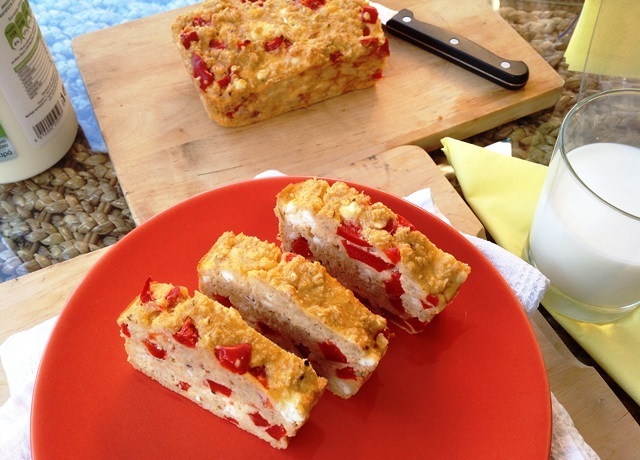 It’s also great as a topping over porridge (oatmeal). 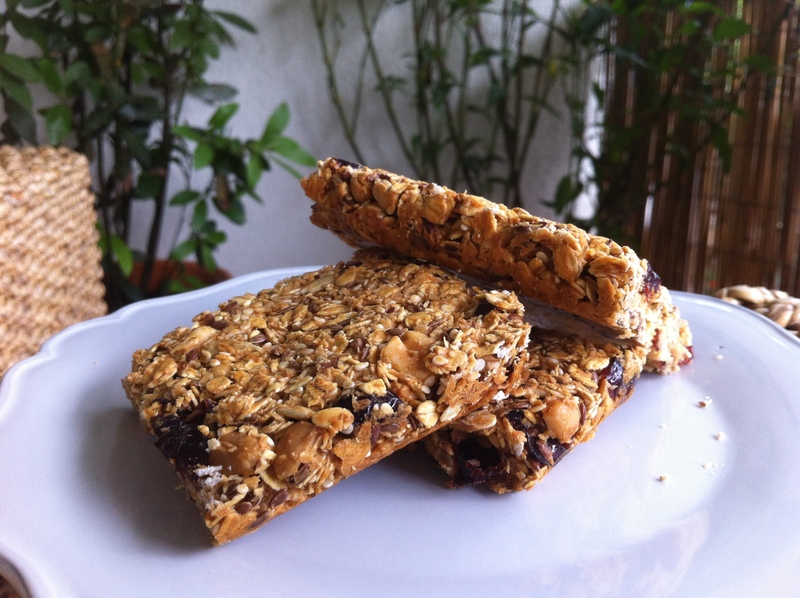 Next up from my picnic menu favourites is a granola bar recipe. I had been looking for a good granola bar recipe for a while, but most of them seem to have a page long list of ingredients which makes them kind of expensive and kind of a pain. Then, while I was looking for something else among my bookmarked items on my iphone, I came across one I had saved ages ago and then forgotten about (I tend to do that). It’s a really easy recipe by Nigella Lawson, with few but good ingredients that suit each other beautifully. These bars are great to nibble on as a snack, or take with you if you’re running out the door with no time for a proper breakfast. I doubt they’re particularly diet-friendly, but they are definitely healthy (or healthier than my usual snacks!). When I made these for the picnic I also made a batch of my favourite granola to have over the duration of my cousin’s stay. This is by far the best of all the granolas I have tried to make, with just the right consistency for my taste (sort of clumpy but not very). Again, it’s one of the healthier versions, with olive oil and honey rather than butter, sugar etc. The original recipe by The Cilantropist (inspired by Healthy Green Kitchen and Saveur) involves cooking it at low heat over a long period of time. It’s getting hotter by the day here in Athens, so having the oven on all day doesn’t appeal to me, not to mention the fear of my electricity bill – so I just cook it for about half an hour, or until it looks golden but not brown! The way I like to eat it is with buttermilk. A friend from work whom I will call The Granola Addict once mentioned that this is how she likes hers and I was quite surprised. I’d never even considered it. I knew some people drink buttermilk but for me it was something I put in cakes and nothing more. Well… good job I tried it. It’s delicious. I highly recommend you try it. Here are both recipes. Preheat oven to 130C and grease a small baking tin (mine is 18×24.5cm). In a small saucepan heat the condensed milk till it’s quite hot but not boiling. Pour over the dry ingredients and mix well till everything is coated with the milk. It’s best if you use a rubber spatula as this won’t stick to the mixture. Transfer the mixture to the tin and spread it out evenly (with the spatula). Press it down well. Remove and let cool for about 10-15 minutes. Then cut into pieces according to your preference. It’s very important that you remember to cut it when it’s still warm, otherwise it gets a bit difficult! Line two baking trays with grease proof (parchment) paper. Preheat oven to 150C. Mix together all the dry ingredients except the cranberries and pumpkin seeds. I always add these at the end so they don’t go hard or burn while cooking. Warm the oil and honey together in a small saucepan or the microwave. If using the microwave heat in blasts of 30 seconds mixing well in between. You want the mixture to become very runny. Pour the oil and honey over the dry ingredients and mix well so that they are all well coated. Spread the mixture out on the baking trays and distribute evenly. I press it down a bit so it sticks together slightly. This way I can break it up into lovely clumps afterwards. Bake for about 30 minutes or as long as it takes to turn a golden colour. Do not let it brown. Once golden it takes only a few seconds to burn, so pay attention! Remove from the oven and let cool. Break it up, add the cranberries and pumpkin seeds, and transfer to an airtight container. This also keeps very well, although it’ll probably be gone before you need to worry about it!